Combine the flour, both sugars, salt, cinnamon and pecans in a medium bowl. Rub in the butter with your fingertips until it's well blended and the mixture crumbles coarsely; it should hold together when you pinch it. Refrigerate the topping until you're ready to use it. 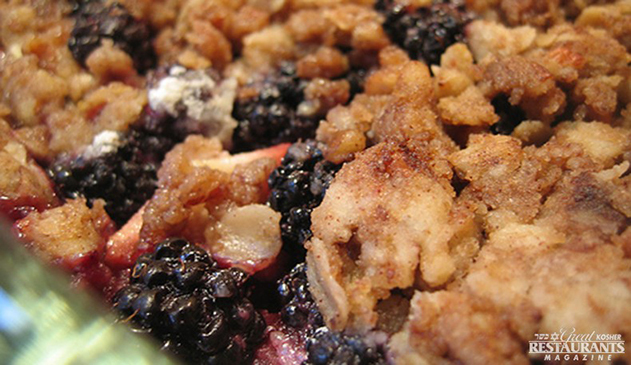 Make the crisp: Place the apples, blackberries and remaining sugar in a medium sized bowl. In a small bowl, dissolve the cornstarch in the lemon juice. Using a rubber spatula, gently combine the mixture with the fruit. Pour the fruit into a greased 8 - 9 inch square glass or ceramic baking dish. Set the pan on a baking sheet to catch overflowing juices. Top the fruit with half of the topping. Do not press down. The topping should be light and crumbly. Bake for 20 minutes. Keep the remaining topping refrigerated until needed. Sprinkle the remaining topping over the crisp and continue baking until the apples are tender when pierced with a knife, the topping is crisp, and the juices are bubbling, another 25 to 35 minutes. Let cool for 20 to 30 minutes. Jeff Nathan, is Executive Chef and co-owner of Abigael’s on Broadway, the world’s largest kosher restaurant. Jeff is well known for his television series, New Jewish Cuisine, which is seen on public television stations nationwide, Israel and several other countries. He is an award-winning chef, restaurateur and cookbook author of two best selling books, Adventures in Jewish Cooking and Jeff Nathan’s Family Suppers. Jeff is a culinary consultant for the Hain Celestial Group and Royal Wines Corporation. Working directly within the research and development branch, Jeff is responsible for many of the new products on the market shelves today. Recently Jeff has broadened his culinary horizons. He has expanded into full service catering, with his boutique company, Jeff Nathan Events. His creative approach to cooking has been enthusiastically received, and Nathan has been profiled in articles in Time, Saveur, Chef’s, Art Culinaire and Food Arts. His Abigael’s acclaim has been noted in the New York Daily News, The Forward, The Jewish Press, The New York Jewish Herald, The Bergen Record, The New Jersey Jewish News, and New Jersey Star Ledger. The Boston Globe and The Milwaukee Journal Sentinel, and several others throughout the nation have featured articles on him. Chef Nathan has appeared on several television programs as a guest chef, including regular appearances on Live with Regis, The Joan River’s Show, Late Night with Conan O’Brien, Roseanne, NBC and ABC News, TV Food Network’s The Best Of... Holidays and won their Throwdown with Bobby Flay challenge.